Kills TB in 5 Minutes! 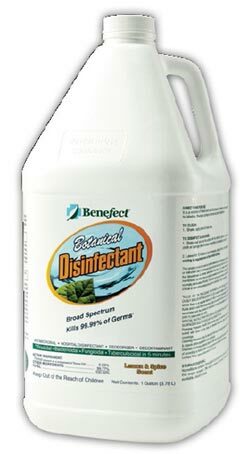 Benefect is a revolutionary disinfection blend of these antimicrobial extracts, particularly from the herb Thyme. Traditional synthetic disinfectants use quaternary ammonia or chlorine bleach to kill germs, however, using the essential oils from plants allows Benefect to achieve an unprecedented safety rating. To put it simply, Benefect is a ‘plant immune system’ in a bottle. How Can a Disinfectant Be Less Toxic Than Vinegar And Still Kill Germs? In nature, plants produce germ-killing ‘essential oils’ to protect themselves from invading microbes, similar to how our bodies produce antibodies for our protection against disease. Benefect surpasses the government’s germ killing requirements for hospital disinfectants. The ingredients are categorized as GRAS (Generally Recognized as Safe) and as Direct Food Additives by the Food & Drug Administration (FDA). You can now use a product that doesn’t require a rinse or wipe. This saves costly labor & time allowing you to do the job faster by saving a whole labor step & lets you move onto the next job faster. This saves you money. It is also suitable for use around children, pets, the elderly and chemically-sensitive individuals. So you can relax about chemical contamination, overspray & evacuating building occupants. Benefect Disinfectant Spray is ideal for use in restoration sites: water damage, sewage backup, mould remediation, fire restoration and trauma scene decontamination. Effectively eliminates odors produced by odour-causing bacteria, fungi & other organisms on concrete, wood framing & studding, trim & subfloors. Surfaces where bacteria, mold & mildew or odours are a concern and where a botanical product is sensible. Surfaces where bacteria, mold & mildew or odours are a concern & where a botanical product is sensible. Similar application sites where bacteria, mold & mildew or odours are a concern and where a botanical product is sensible. Surfaces where bacteria, mold & mildew or odors are a concern & where a botanical product is sensible. Surfaces where bacteria, mould & mildew or odours are a concern and where a botanical product is sensible.